I have an insatiable sweet tooth. Most of the time it's screaming for chocolate and my newest obsession, clotted cream ice cream. I don't know about yours, but my sweet tooth most certainly does not go away just because I'm trying to eat healthy. I find that if I ignore it, the cravings just get stronger and the distant voice in the back of my head that is asking for chocolate, turns into a persistent yell that will not stop until satisfied. My solution? Try to appease the voice when it's still a distant voice. This baked apple dessert is pretty enough to fool me into thinking I'm eating a much richer dessert. Really, all that it takes is a touch of sugar and honey to get those apple pie flavors going on and I'm a happy girl. If I'm only making this for one, I'll still make enough for two and keep the leftover baked apple to use as a mix-in for apple pie frozen yogurt. Peel and core the apples. Cut one apple into very thin slices to use for the decorative top to the dish. Take the remaining five apples and cut into a small dice. 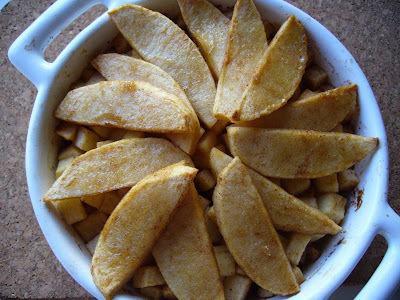 Place all the apples in a bowl and add the lemon juice, honey, 1 T of brown sugar and cinnamon to the bowl. Stir to coat. Divide the diced apples between to oven safe dishes and top with with the decorative slices, arranged in a circle. Sprinkle 1 t of brown sugar over each dish. Place in the oven and bake for 30 - 35 minutes. Let cool slightly and enjoy! Baked apples are a great alternative to apple pie. I was at the farmers market yesterday when they were baking apple pies. OMG the smell was divine! I serve mine with a spoonful of Fage on top. I managed to fight off the temptation of the apple pies and picked up some fresh figs instead. I will try your baked apples this weekend. They sound very yummy and healthy! There is a constant battle between me and my sweet tooth. I will have to try this. Love the blog! Wow How original to think of the clotted cream. This a great Fall recipe and love your ice cream as well. Fruit and cream need I say more! Pure bliss! Mmmm... I'm sure that this went great with your ice cream. It looks so good. RYC: if you love wheat bread then you must try the recipe. I promise you that you will not be sorry! :-) If you whip it up in a KitchenAid the whole recipe goes without a snag. Love healthier desserts like this! I eat an apple everyday and I love any apple dessert. Your is so simple to make. Apple and cinnamon is always so good. When you bake apple and cinnamon together, the whole house smell so good! Love it!